On the other hand, demands for zero-backlash mechanisms still exist. To meet such demands, we released our Standardized Anti-backlash spur gears, which although they cannot remove the backlash completely, can greatly minimize it. 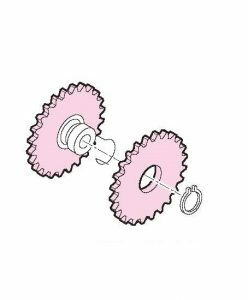 Our Anti-backlash spur gears adopt a time-honored mechanism that has built-in springs between gear A and B that pull each other in order to pinch the mating gear like a scissor. 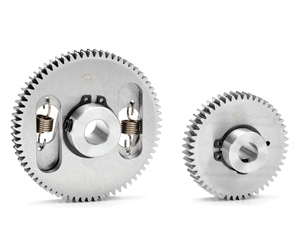 When rotated, the direction of the gear is reversible since the springs of the Anti-backlash spur gear can continue to maintain suitable torque by pinching the mating gear. 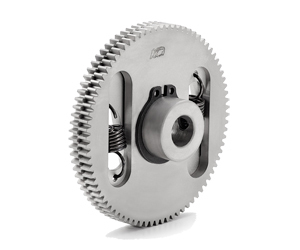 If interference occurs due to gear quality, the Anti-backlash spur gear can help absorb the interference by stretching the spring mechanism between gear A and B while engaged with the mating gear. 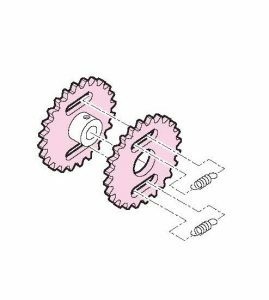 You can verify the dimensions of our standard Anti-Backlash Gears through our PDF catalog or our Newly implemented Gear Selector provided by Part Community. Free CAD data is available on our website. Click on the logo below to access the Gearbox Selector. Please request your Quotations for Anti-Backlash Spur Gears through our “Request For Quotation” page. We can customize our standard Anti-Backlash Spur Gears to suit your specific applications, please consult with us. We are offering gear customization services. For more details and examples of modifications, please visit our “Gear Modification” page. 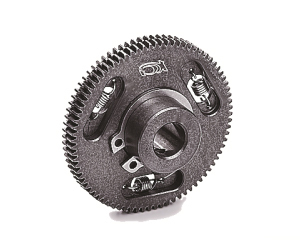 Please refer to the following link for precautions before using KG Anti-Backlash spur gears. Teflon coated to prevent scuffing and provide a smoother motion. Nitrite treated to prevent scuffing and provide a smoother motion. Precision ground teeth for a more accurate positioning , less oscillation and lower noise at high RPM. 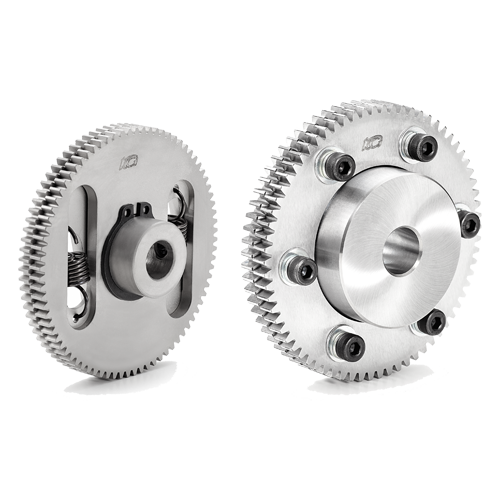 Suitable for higher torque and higher RPM applications when compared to our spring type anti-backlash spur gears. ASG TYPE For our ASG series, the operation method works by loosening the setting bolts to assemble our ASG series gear with the matching gear and then adjusting gears A and B in order to reduce backlash to a minimum. 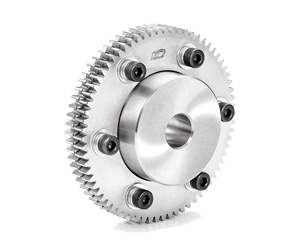 The ASG series works best for applications that require only a minimal backlash adjustment, Higher torque applications and that are matched with high quality gears. 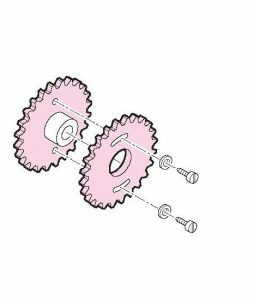 BS TYPE Our BS type gears use a Circular Arc Spring placed between gear A and B in order to eliminate the backlash. 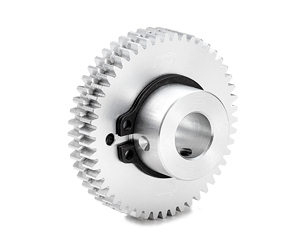 BS series gears are recommended for applications that require a lower amount of torque. BW TYPE Our BW type gears use a spring suspension method placed between gears A and B. The tension of the spring will allow them to slip relative to each other in order to eliminate the backlash by engaging with the matching gear and holding it in a scissor like motion. Copyright © KG STOCK GEARS All Rights Reserved.